To knock out the basics first, the BOC did raise its benchmark interest rate by 25bps to 1.50% as widely expected. In the accompanying monetary policy statement, the central bank noted that it will continue to take a “gradual” and “data-driven” approach to interest rates and that higher rates will be needed to restrain inflation. The BOC remained generally optimistic on economic growth, with GDP forecasts of +2.0%, +2.2%, and +1.9% in 2018, 2019, and 2020 respectively. While the policy did cite some concern about global trade, it noted that that the higher oil prices should moderate the impact of any trade restrictions from the US. In his press conference, BOC Governor Poloz seemed to place more emphasis on the recent US tariffs, noting that further tariffs would cause the economy to slow and inflation to rise. He’s since gone on to note that trade tensions were the single biggest issue at this week’s BOC meeting. 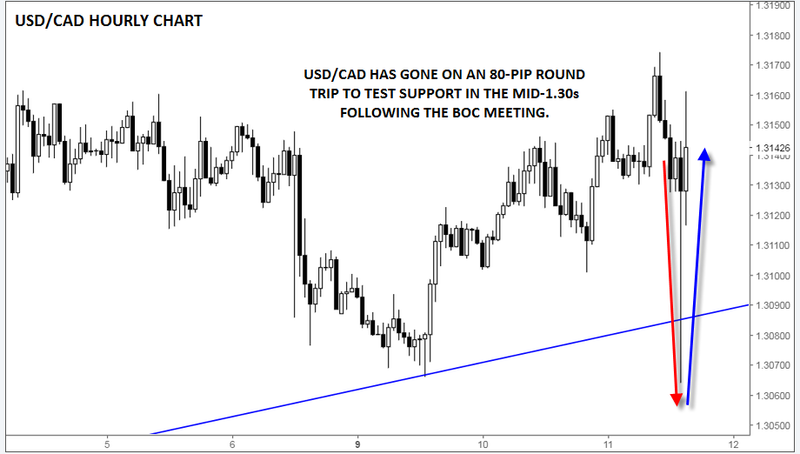 USD/CAD has gone on a quite a ride since the release, with rates initially falling sharply (showing loonie strength) to hit a one-month low near 1.3060 before rallying all the way back to trade in the mid-1.3100s, where rates were earlier today. The fact that oil was unable to rally despite the largest drawdown in oil inventories in over two years has certainly dented the appeal of the loonie as well. Indeed, oil is presently trading lower by 2%, casting a pall over any of the BOC’s economic optimism. Previous articleLopez Obrador: A Helping hand from Mexico or a hand-out?